2D Barcode Scanner use for Excise Purpose. 2D Barcode Scanner -Are the fourth and newest type of bar code reader currently available . They use a small video camera to capture an image of a bar code. The reader then uses sophisticated digital image processing techniques to decode the bar code. Video cameras use the same CCD technology as in a CCD bar code reader except that instead of having a single row of sensors, a video camera has hundreds of rows of sensors arranged in a two dimensional array so that they can generate an image. They also come in patterns of squares, dots, hexagons and other geometric patterns within images termed 2D (2 dimensional) matrix codes or symbologies. Although 2D systems use symbols other than bars, they are generally referred to as barcodes as well. 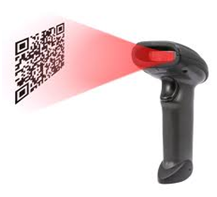 An up and coming barcode that 2D barcode scanners are most commonly scanning are QR Codes. A QR code is also known as a quick response code. It is a type of 2D barcode that has been more commonly used in marketing. QR codes are read by mobile phones that have a QR code reader application. The purpose of QR codes is to give a consumer additional information about the product, an event, or even a promotion. Businesses are using QR codes in billboards, print medias and even on product packages. Realtors are using QR codes on business cards to lead potential buyers to their website and listings. Retailers and restaurants are using QR codes to be more personable with their customers, offer discounts, as well as lead their customers to their social media pages, like Facebook and Twitter. QR codes are easily made through QR code generator sites, and can be placed on anything your heart desires.